A good thing is very precious stuff and it is the task to preserve it proves even more difficult then to possess it. We often see the people (or even things) with good attributes got corrupted over time, based on the situations and circumstances. One has to be very very strong (especially mentally) in order to keep himself intact from such attacks from outside entities. We often see that there are temptations and efforts constantly made by some factors of the society to find and utilize the vulnerability of good stuff. 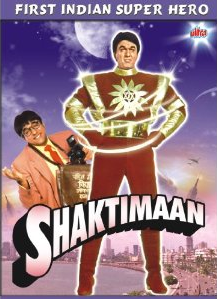 Moving ahead in reviewing the Hindi TV serial – Shaktimaan – which is about a Super hero with its own root and abilities, an attempt to show and elaborate the good v/s evil stuff, we see such incidents. J. D. is the mayor of a city and he is a very genuine fellow. He have enough money to live a luxury life and have no greed to get more by doing wrong things. He owns a channel but he have some strict rules about the program aired on the same. He doesn’t allow low quality programs to boost his channel ratings! He was asked by his assistant that Vilasrao is keen to meet him. Knowing that Vilasrao is associated with wrong activities including illegal stuff he refused to meet him but after insisting by his assistants he finally got ready to meet him. During their meeting Vilasrao presents him a sculpture found from the disputed land under his control. Definitely his intentions are not genuine and nor does his efforts. J. D. finishes the meeting and went for his daily routine and we got to know that both his assistants are somehow associated with Vilasrao! Yes, this is often a tendency of the people associated with wrong work to keep his allies in the office of authorities (and even at his personal places), to get informed about them, find their weaknesses, propose them with bribes and other offers, to get their (mainly illegal) work done. Here Gangadhar was reading a newspaper and was unhappy seeing the rise in the wrongdoings over the city. He found an advertisement for a post in a local newspaper and he was keen to apply there. We also see that the editor of the newspaper was receiving a lot of calls for publishing news by the reporter Geeta Vishwas about a criminal (well, you know the criminal). He dismisses Geeta and at the same time he was visited by that criminal threatening him, with his bodyguards. Geeta however doesn’t fear from the criminal or his henchmen and fearlessly asked him that it is she who have prepared the news. And she also affirms that she will make the proofs available to public against the criminal by whatever mean she need to go through! Who is the criminal, and what are the claims Geeta have against him? How will Vilasrao’s stuff with Mayor J.D. move ahead? What role Shaktimaan aka Gangadhar have to play here? What will be fate of Geeta as she opposed the cruel criminal openly? Well, all these and many more questions can be answered in the TV show as it keep progressing. The henchmen of Vilasrao are not looking convincing, rather they look funny when trying to look dangerous! Late Goga Kapoor (playing Vialsrao) is first rate though. Mukesh Khanna have to play a little in these incidents but he is convincing in his parts. Kitu Gidwani is a seasoned actor like him and performs pretty well. The actor playing J.D. have rich get-up but need to improve his acting, he is good though. The girl and guy playing his assistants needs to work on their acting skills. When you compare the stuff with today’s serial, you can see a lot of things including the objects used can be more convincing. The TV serial is though not for showbiz purpose only and hence the content is the most important thing. The screenplay is setting up the things in a way that the future incidents can be linked with the current one. Nice writing which is inspired by some mythology and some good movies and TV shows from various genre mixed with imagination. The incidents happened in the Gangadhar’s way to the newspaper office are made to create fun, they look childish (though children may find them funny). The TV serial however conveys the stuff about morals and ethics very genuinely which makes it a good watch despite of some minus point of the same. Especially today when we find it difficult to have some genuine material to watch for the growing next generation which inspire them to do good stuff, be good and possess real human qualities, availability of such TV serials on DVD is a good option to go with.